J.R.R. Tolkien's tengwar, used for writing his Elvish languages as well as English and other European languages, is truly a beautiful script: it is steeped in the calligraphic traditions of medieval European writing, elegantly and systematically represents most consonant sounds, has strong lines and a hypnotic, engaging repetition of basic shapes. But, as a script, the tengwar causes me great frustration. Tolkien devised an extraordinarily elegant way of representing consonants, but he never really settled on a way of consistent or systematic way of representing vowels. There are full modes and tehta modes, all varying. Even the full modes barely have enough vowels for English, and the tehta modes are wholly inadequate. 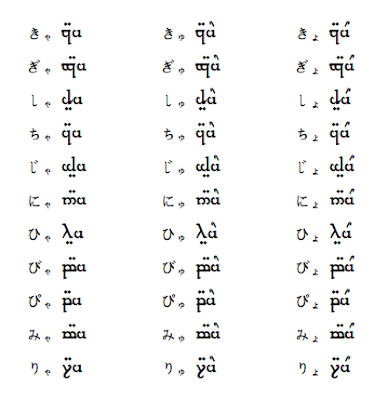 Furthermore, many fans of the scripts find phonemic English writing confusing, and so most people write in the so-called "orthographic" modes, which often write consonants phonemically and vowels according to their representation in the Latin alphabet. Using the five vowels of the Latin alphabet to write the dozen-plus vowels of English is an ugly hack. Using the Latin vowels as written in English in an otherwise phonemic script is an ugly hack of an ugly hack. Many people are intrigued by the idea of writing English in an abugida, and the tehta modes are probably as close as it's practical to come. But I find it pretty awkward. There are a two main problems with writing English this way: English has numerous consonant clusters, and English has too many vowels to use diacritics easily. But it'd be great for Japanese! Japanese has a simple syllable structure, a simple vowel inventory, and is already written with a syllabary. 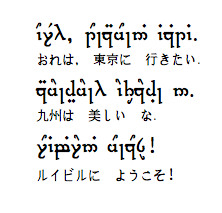 So here is a Japanese mode for the tengwar. For more information about the tengwar, consult the guides at Amanye Tenceli or Tolkien script publishing. 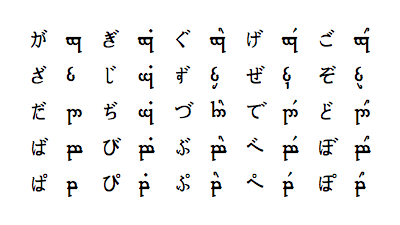 These samples were created using the Code2000 font, which encodes the tengwar as in the ConScript Unicode Registry. 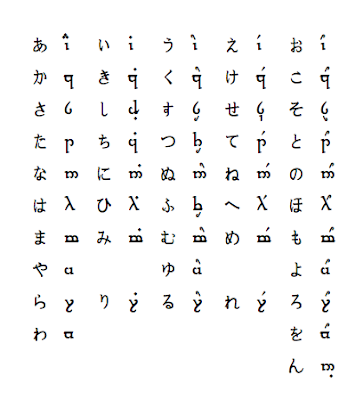 The iroha is above, a a few sample sentences follow, and the tables of tengwar and kana are at the bottom. These tengwar here generally follow rōmaji. The usage of súle for つ and anto for づ are unsystematic, but seemed like the best borrowing. The long vowel carrier is used in an unusual way; it is merely placed after a letter to show that the vowel is long. Note also the bottom bar used for palatized consonants, and I've offered no way to represent the sokuon っ. Significantly revised, so one can write with a sokuon. Use the doubler bar (underbar) to mark a consonant that would be proceeded by a sokuon. I love Tengwar and have several of my own versions used for writing English. About time that there was one for Japanese. I'll see if I can come up with one for Korean. Perhaps the sokuon (since it is really drawn as a small tsu in Jp) could be a 3/4 or 1/2 scale súle. It would do the job, and be easier for those of us who know how to read Japanese already, to read it in Tengwar. Maybe write it with an extra identifying mark for Katakana? You know how Gothic English script was right? It had thin lines running vertically through capital letters to embellish them. Something to that effect could be done at the beginning of a word written in Katakana. I also have an idea for the Kanji, basically, you modify the existing Kanji so that it fits the flow and forms of Tengwar script.I've already done the kanji for cha (茶) in this way and I'll host the image and then come back and give you a link. Sure, that would probably be immediately apparent to people who can read kana. For this, I tried to be constrained by the existing Unicode implementations of tengwar, which IIRC are still pretty basic. Much more would be possible writing with a calligraphy pen, of course. I've wondered before about experimenting with writing kanji with Western calligraphic pens and tools: it would be different, but possible, and maybe interesting. Surely someone's tried that before? If you have something along those lines, I'd be curious to see it. In general, though, I stick to roughly phonemic scripts when playing around with alternative scripts for Japanese. Japanese is a beautiful language, but it has what must be the world's most complicated writing system, which is quite...onerous...to learn.